Since I’ve been reading so many ebooks on my Palm Tungsten T, I really wanted to take it on vacation. So I loaded it up with a couple of books, and some Audible recordings of Science Friday. But I was worried about the batteries–they’re notoriously short-lived on the Tungsten T. I had a AA-powered “emergency charger” that I bought on Ebay, but if the batteries in there aren’t absolutely fresh, it just draws the charge down! 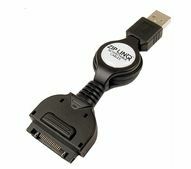 So I bought one of these nifty retractible Zip-Linq sync and charge cables on Tiger Direct–thinking I could just plug in to my laptop’s USB, or even the car adaptor (sitting in the glove compartment). I tried it first in the hotel room in Groton, left it plugged in to my laptop overnight, and in the morning it was only at about 85% charged. That’s funny, I thought. But I stopped thinking it was funny as I watched the charge drop literally before my eyes from 85% down to about 6% (less than where it was when I had plugged it in). I couldn’t figure it out–I thought it might be because my laptop’s USB port was unpowered–but it had charged my cellphone successfully. I thought it might be because I was charging the cellphone at the same time, but a second test ruled that out. Luckily, at the last minute, I had thrown the AA emergency charger into my bag, so I was able to survive. I finally did some webchecking, and discovered that there are two ziplinq chargers for Palms with universal connectors, an A and a B. The one Tiger Direct had sold me, even though their website claimed it was compatible with the Tungsten T, was actually an A which is not compatible with my Palm. Ziplinq’s website makes this clear. Tiger does not. Did a little more searching and finally, happily, found that Cables4Computer.com is one of the only places to carry the B cable I needed. And now I’m charged, charging, chargable.